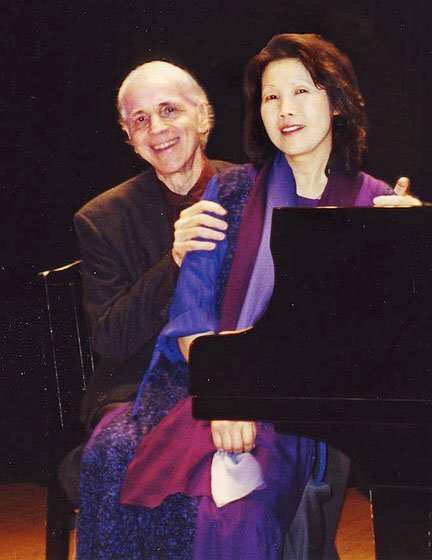 Russell Sherman and his wife Wha Kyung Byun celebrated 38 years of marriage Sunday evening with a two-piano demonstration of devotion to Schubert, to Mahler and to each other. The audience at New England Conservatory’s Jordan Hall stood up and cheered, and several hundred fans lined up to congratulate the couple backstage in what can only be called a lovefest. Both players are popular, long-term faculty members at the conservatory. Their appearance was a celebration of their wedding anniversary and a highlight of the fall schedule of free performances by NEC musicians. The nasty weather and the threat of hurricane Sandy perhaps discouraged some would-be attendees, however, leaving half the seats empty for this rare recital — made even rarer by its pairing of man and wife; they last performed together on the Jordan Hall stage eight years ago for their 30th wedding anniversary. 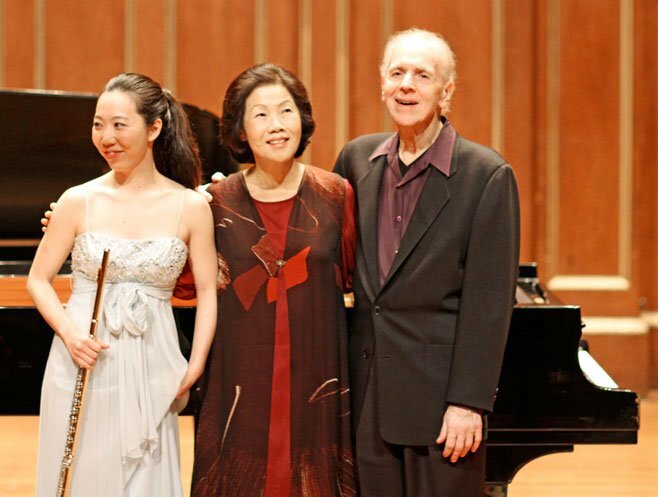 Piano lovers may regret missing the event, for Sherman at 82 probably does not have that many more full-blown recitals left in him, although one never knows, and Byun rarely performs these days. Also appearing was lovely flutist Sooyun Kim, who provided the lyrical solo based on the “Das Knaben Wunderhorn” song in the Mahler 4th Symphony transcription (a part usually sung by a soprano in the original orchestral version). She was a perfect addition in every respect – from her mint-green gown and golden flute to her lilting, expressive playing. Sherman, who enjoys a solid reputation across the country for his constantly varying interpretations of the piano canon, looked alarmingly gaunt and frail as he shuffled toward the piano clinging to his wife’s arm. Appearances can be deceptive. They took their places for the four-hand Schubert Divertissement a la Hongroise in G Minor, with Wha Kyung Byun playing the primo part with a luminous elegance. Sherman gallantly accompanied her, staying very much in the secundo background. But as the themes developed, he seemed energized by the music, and by the final chords was in vigorous form with a beaming smile alongside his talented wife. The Schubert opens with a delightful mix of Viennese melancholia and rousing gypsy and folk tunes, marked andante. Schubert had absorbed some of these melodies while in Zseliz, Austria, tutoring the daughters of Count Esterhazy in the summer of 1824. It was there that he composed this and other two-hand pieces. The second movement, Andante Con Moto, brings in a sentimental Hungarian feel reminiscent of Liszt’s Hungarian piano works. And the piece rounds off with an allegro in rondo form, making good use of the same material Schubert used in his “Hungarian Melody” D. 817. Here, the primo part contributes a Magyar joy that had the Byun tapping her foot while playing. Arguably Mahler’s most accessible and popular symphony (although this reviewer would argue – what about the 2nd and the 9th ? ), it has also been transcribed for chamber orchestra as well as for two pianos. And it did what transcriptions often do: it brings a much sharper clarity of detail than one can hear under the weight of a full orchestra, especially in Mahler’s lush orchestration. By now, Sherman was in his element in the dominant part. The opening sleighbells at the top of the keyboard signaled a colorful experience to come. Sherman got so caught up in the music that his sweeping left hand involuntarily danced in the air to the surge of the music. I was reminded of his eccentric but fascinating book “Piano Pieces” in which he wrote, “The hand must be supple. As the Navajo tradition advises, we should move through space with the lightness of a hummingbird.” Aha, so that’s what he was doing! The final movement brings in echoes of “Des Knaben Wunderhorn,” the inspiration for much of this symphony. It calls for a soprano – sometimes performed in our day with a boy soprano – but uniquely accorded this time to the gorgeous and talented Sooyun Kim and what Sherman called “her magic flute.” Among the lines of the song are these: “There is no music on earth that can be compared to ours.” She lived up that lofty aim. Beautiful piece! I wish I had been there! A small correction: it’s “Des Knaben Wunderhorn”. I don’t think it was the weather that half of Jordan Hall was empty; people clearly can see now how disturbed and weird Sherman is. This even was a waste of time. And clearly the people cheering and giving flowers were friends and students. I will be glad when he is not playing anymore, his wife can’t play anyway. Big empty names, that’s what they are. This is a sad, gratuitous comment. Why disparage Sherman and Byun, in the twilight of their careers? I may be wrong, but these small remarks smack of a disaffected former student, or perhaps someone who’s lost a competition to one of their proteges. Sherman’s art can be disturbing, and he could be considered ‘weird’ by the standards of so-called ‘normal’ society (i.e. rock and rap fans and mall rats), but he is always serious, always provocative. And ultimately, almost always invaluable. How many of us can claim such a legacy? What a bogus way to argue. Nikolas’s shots are crude and personal, sure, but hardly without foundation, or necessarily motivated only by some prior imputed conflict. For a great many former fans, Sherman’s increasing rhythmic waywardness (to put it as nicely as possible) over the last two decades has been offputting, if not downright sabotaging of the strength of the score. Worse, it was regularly explained under the guise of ‘others are mere timekeepers while I hear and convey the deeper mysterious pulses of the music’ etc. For some of us the real question remains, Where are the solid, splendid, clear-eyed mastertapes of this artist’s Beethoven sonatas and Liszt ‘Transcendental’ etudes made almost 40 years ago for Advent cassettes? The tapes were turned over to the Attenboroughs (may have this name wrong), who pressed several Sine Qua Non label LPs. Not a trace of any of this since; they seem to have vanished. Those recordings would be well worth recovering to perpetuate the Sherman legacy, more than the many variable recordings since (some of which are also pretty good).